Outdoor home decoration is every bit as important as interior decoration and as an outdoors lover I definitely stand by this. When a person approaches your home first thing he or she will notice is it's surroundings and garden (if you have one) and for the majority of us, keeping the outside of our houses looking lovely is just as important as having the inside looking beautiful. Everyone knows I'm a flower lover and after becoming bored with how drab the outside of my house looked, I decided to invest in some beautiful pink window boxes and pots, to plant some beautiful seasonal blooms in. I can't even begin to tell you the difference it now makes to me, pulling up outside my house and seeing some pretty flowers outside. I've even received compliments on the look of my house and they're really lovely to hear. It's been proven that quality of life improves significantly if you are living in a clean and neat environment and I know I'm always a lot happier when my window boxes are in full bloom outside and the house is clutter-free (which is quite rare, I do have two small children after all...). I thought I'd share some simple yet effective ideas on how to spruce up the outside of your house and your outdoor spaces. Although most homeowners prefer having a neat lawn, it can sometimes come across as quite plain - I know I pass houses on a daily basis and notice the lack of colour in their gardens. It's my dream to have a wildflower garden someday, so I'm definitely not a fan of the neat lawn look. 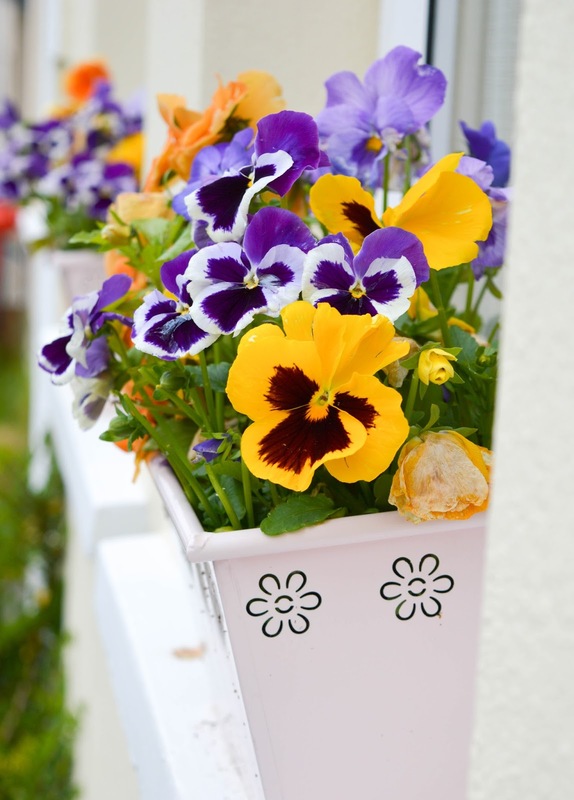 Planting flowers is a simple way of making your house stand out and inject some personality into your garden and the great thing about flowers that you can remove them and plant something else if you get fed up or want a seasonal look to your outdoor space. You don't even need to have a garden to grow flowers or plants. Window boxes are a great option, as are plant pots outside your door and I think the whole of London has photographed that fab house in London with the wisteria climbing up it's wall and gates (house of dreams!). Like flowers, a hedge surrounding your property can be a great way of giving a beautiful look to your garden, however, there is another and better reason why you should get one - privacy! If you don't want prying eyes looking into your garden (who does?!) then this is a great way to seclude yourself and close off your space, making it perfectly private. A hedged garden is also a great option for those who have young children. A hedge helps to close off the garden and keep children in, leaving them able to play safely without wandering off - I grew up in a house with a hedged garden and it was the perfect play area. Now, for someone like myself, having a pool is the stuff of dreams, but for most homeowners the thought of having a pool can have a lot of negativity - they can be expensive, they need a lot of maintenance and fixing over time and things such as pool pumps and accessories can be really troublesome. Regardless of this, pools are something that should always be considered even if it’s only a dream. A pool can be an amazing focal point for a back garden and the rest of your garden can then have some landscape design to compliment the pool area. They are great for kids and for swimming and I know a pool would definitely be something we'd get if we ever had the money. Most homeowners see a patio as space where you put several tables and chairs and where your family can get together for drinks or meals al fresco, but a patio can also serve as something else. It can be a special, semi-covered area of the backyard where you can retreat during summer. It is the best way to enjoy the sun and breathe fresh air. I've seen so many pretty patio ideas on Pinterest, with people using lights and verandas to create cosy, beautiful spaces and I would love to have a space like that in my own garden. Paint colour choices for your house and front door can make a big impact on the look of your home. My dream house would be pale pink with white windowsills and a white door, but I've seen rows of pastel houses and ones with shocking pink doors which look absolutely amazing! It's amazing what a lick of paint can do to totally transform the look of your home - inside and out. I hope I've given you some inspiration for embracing the outdoor areas of your home and making them a beautiful space for you to love and enjoy all year round.